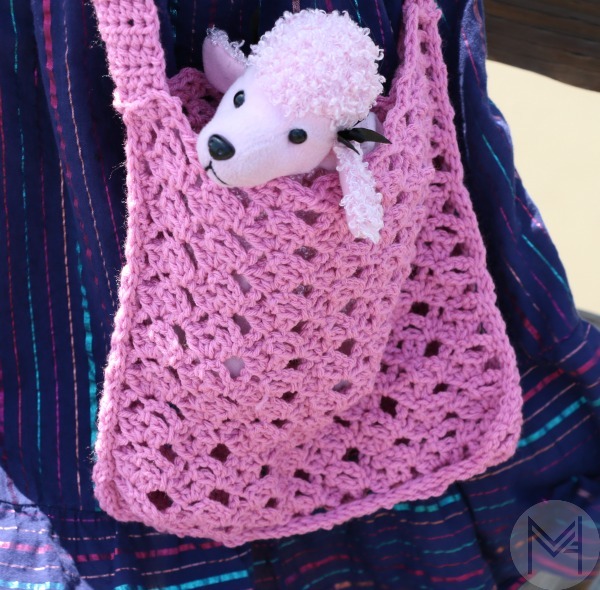 I have a new crochet tutorial for you, the Lacy Crochet Beach Bag! This project has been in the works for a long time, so I am so excited to bring it to you! Continue reading for all of the materials and instructions that you need! Find you ad free version HERE! 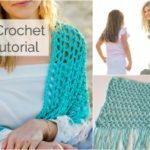 This is a more advanced beginner pattern, leave me a comment if you would like me to make a beginner beach bag tutorial!! Hook size recommended on package – mine was 5.5 mm. Continue rows 2-3 to create bag panel. End with a row 3. Make 2 panels, mine measured 16 inches wide x 17 inches tall. I used 1 ball of yarn per panel. Finish off and weave in end for 1 panel. 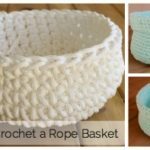 On the 2nd panel, use the remaining yarn from your ball to slip stitch down the side, across the bottom and back up the other side of the bag. Weave in the ends. 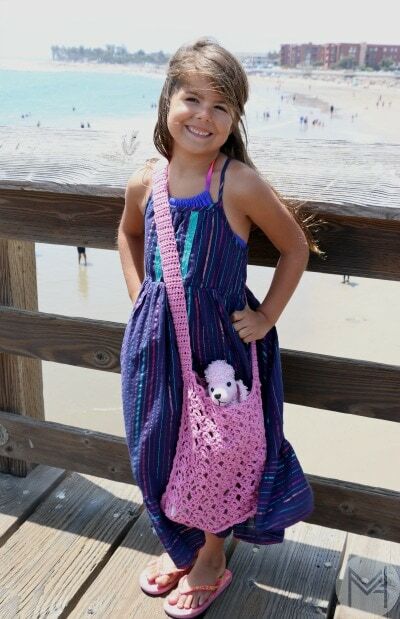 You have 2 options to create the handles of this crochet beach bag. You can purchase some wood handles from amazon or your local craft store and attach them to the bag with these removable straps to make washing easier. 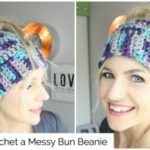 You can also add one long strap. 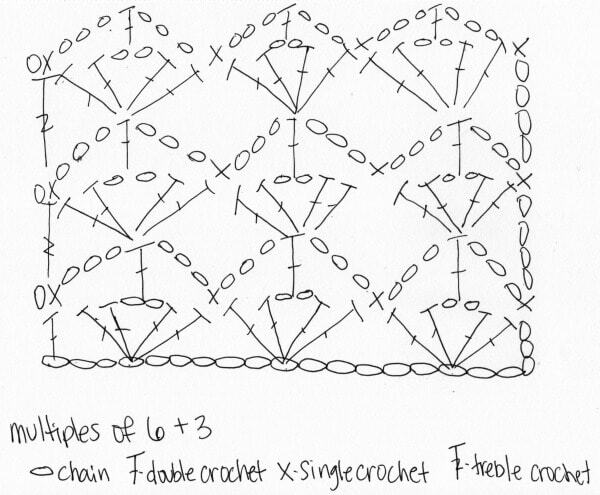 (leave a longish tail for sewing onto bag) ch 9, hdc in 2nd chain from hook to the end of the foundation chain. turn. ch 1, hdc in each stitch all the way across. Should be 8 stitches. Continue until strap reaches 5 inches long. 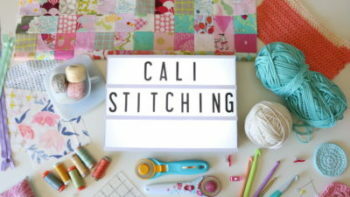 slip stitch in 3 stitches. ch 2, skip 2 stitches and sl st in remaining stitches. Make sure your button fits snuggly in this loop, if not make adjustments. Weave in tails on the slip stitch end. 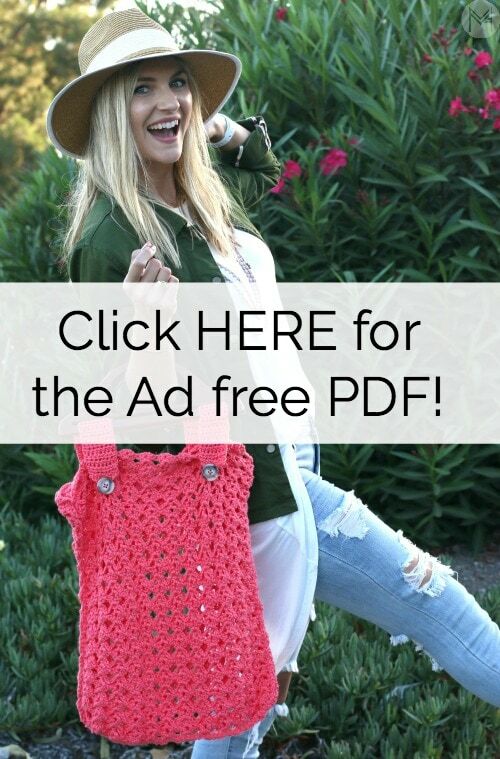 Ad free version: CLICK HERE! 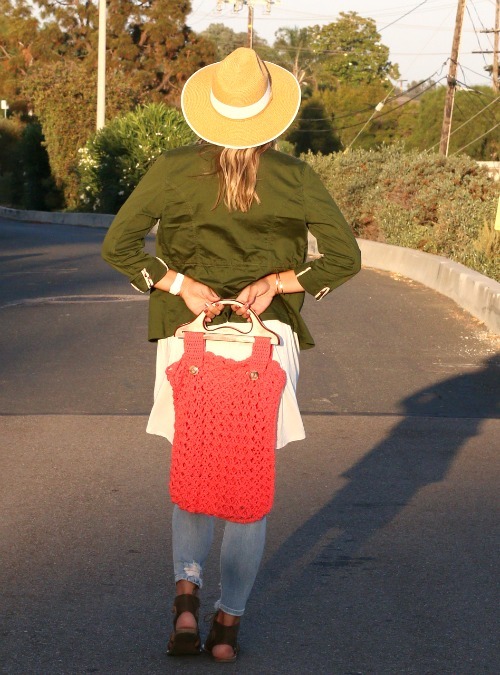 Using a hand sewing needle and some strong coordinating thread, sew the button onto your bag. Mine were place 4 (shell rows down) from the top of the bag, 4 inches from the sides. If you have different measurements or handles than I do, place your straps, handles and buttons in place and make sure the measurements and sizing work for you bag. Sew the button onto the bag in the appropriate spot. Be sure it’s secure, create several knots on the backside to attach. Sew the small straps onto the inside of the bag using the yarn tail and a yarn needle. 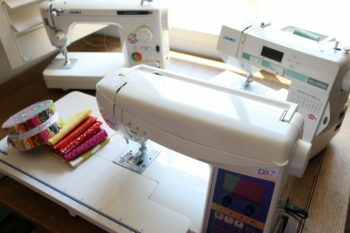 Make sure you sew the strap in the appropriate spot so that in can pass through the handles and over the button. Sew the strap onto the bag securely, weaving in the ends. All done with the handle version! If you would prefer to make the strap version like my darling daughter is modeling here, this is what you do! All done with the strap version! 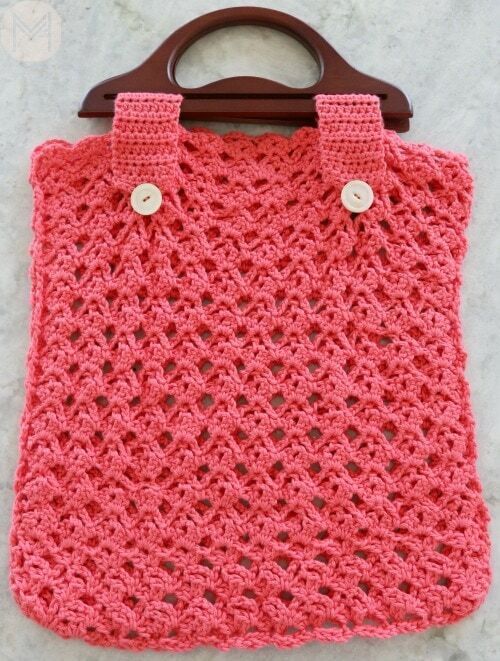 I hope you enjoy making this crochet beach bag, let me know what you think of it! Thank you to my step mom Belinda for helping me snap these photos! Here is the full video tutorial! *This post contains affiliate links. THANK YOU for supporting creative small businesses. 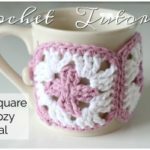 Ad free version of the pattern can be found HERE!